Equinox Brewing: Great Beer, Excellent Art. What’s Not To Love? I was born–and celebrate my birthday each year–on the Autumnal Equinox (though it sometimes falls the day before). So “equinox” has always had somewhat of a special meaning to me. When I first heard about Equinox Brewing, I knew I had to check it out. Before I knew of them, I saw someone wearing a shirt with a great logo; it was this which first piqued my interest. I absolutely love their logo (pictured below, from their Facebook page). And I noticed they change up the tree to fit with certain months (e.g.–chili peppers on it for “Spicy September”) and/or for special beer releases. I was extremely excited to see a shirt that even had a squirrel under the tree, though sadly they did not have my size. And then, upon approaching their tap room, I saw yet another excellent work of art: a mural on the outside of their place. 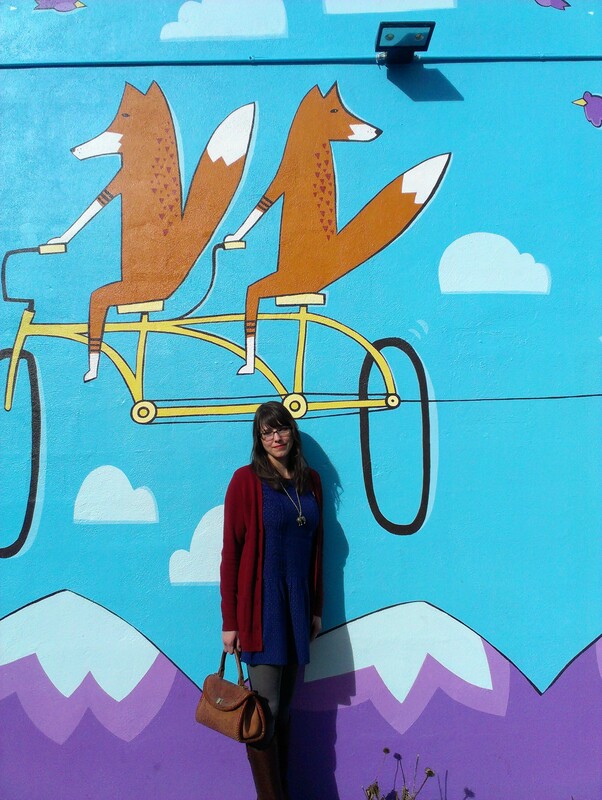 I adore foxes (almost as much as squirrels), so I just had to get a picture of me with part of the mural. I think it’s safe to say I was quite fond of Equinox Brewing before I even walked through the door. But, seeing as how I kinda like beer–just a little bit–I figured I should sample the goods. And sample I did. 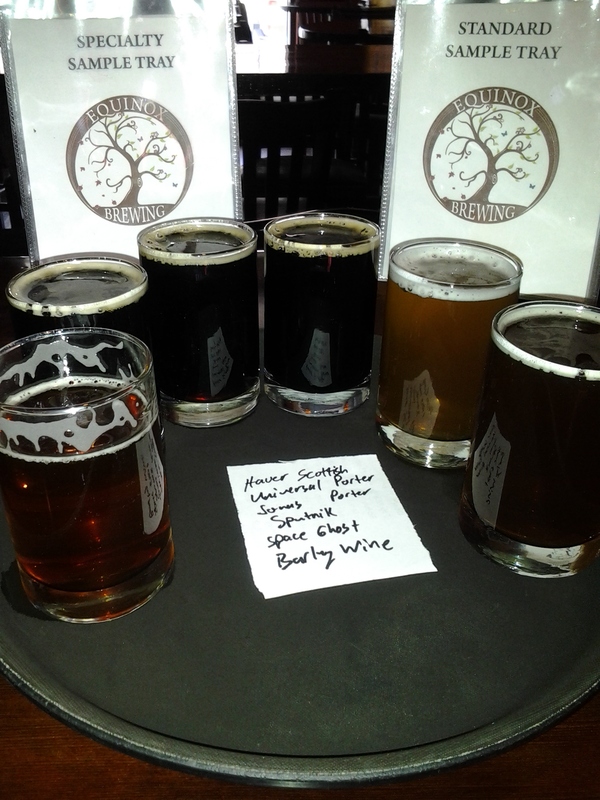 They had lots on tap, and I chose six tasters: Universal Porter, Sputnik Imperial Stout, Midwinter Warmer Barleywine, Jonas Porter, Space Ghost IPA, and Haver Scottish Ale. All were good (though the Scottish Ale was a tad bland for me personally) but a couple of them really stood out. 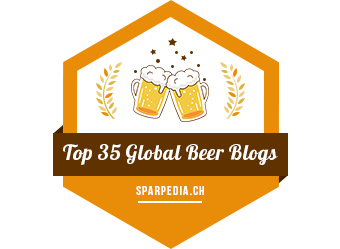 I especially enjoyed the Space Ghost IPA and Universal Porter. 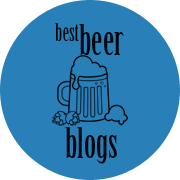 Those were by far my favorites–both great brews. Anyone who has read my posts knows I’m a hop-head, so I was happy to discover yet another new (to me) IPA that I love; this one had lots of grapefruit character and was delicious. And it’s always exciting to find a good porter, as many of them are weak and flavorless. Thanks to Equinox I have two more beers on my “must drink again” list. The tap room is nice and welcoming, they have a beer garden in the back, and a plethora of interesting beers on tap. If I lived in Ft. Collins I would be there every week. 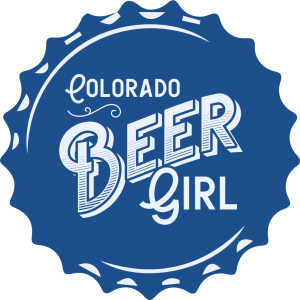 If you live in or near Ft. Collins I suggest you stop by, order some tasters, and make yourself comfortable. Cheers!